The Illume Retreat is an experience unlike any other. We take a unique approach we like to call productive rest, which is a creative combination of rest, relaxation, and active learning that enables us to build the businesses of our dreams. 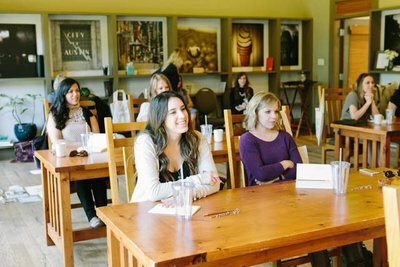 Through planned periods of goal setting and introspection, educational speaker sessions, and hands-on creative breakouts, we walk through a curriculum that leaves you feeling refreshed, empowered and focused as you move forward. Our approach centers around the desire to encourage and prepare you to do business well. For us, it’s not about teaching you the latest marketing ploy or social media platform in order to add more to your ever-growing to-do list. Instead, it’s about refining your workflow, systems and approaches in order to get to the heart of your best work. It’s about equipping you to walk away with a clear plan to live the life that you’ve always dreamed of, and how your business can make that happen. Through actionable takeaways, inspiring conversations, and plenty of community building, this little retreat seeks to help you return to what matters most in your life. You’ll step away from your busy life and return feeling refreshed, inspired and motivated to pursue your big goals. "If I had passed on Illume, I’d still be hiding at my kitchen table behind blog posts I know no one is reading, meager attempts to find new clients and pretty pictures on Instagram that ten people see. That’s comfortable, but it’s not helping anyone, least of all myself. Instead, and because of Illume, I’m enjoying the satisfaction of helping hundreds of creative entrepreneurs through educating them or advocating for my clients' interests legally. I have the best clients in the world whom I absolutely adore and I wake up to a job I love every day. We read about it all the time, but this is real life for me now -- this dream I thought was only possible for the people who were smarter, earlier, more whatever than me -- this dream is not just for them. This dream is for me and you." "if you want to build a business you love, surrounded by a supportive, brilliant community, Illume is an investment you can’t miss." More than the cozy accommodations and all-inclusive experience, the illume retreat is a catalyst to propel you forward to new levels of intentional success long after our time together ends. Registration is limited to just 10 attendees in order to preserve the intimacy of this retreat. registration is officially open for our 2019 retreat!